The Stellar Trader trading platform from Stellar Trading Systems offers an integrated suite of applications, all designed from the ground up, delivering a rich, responsive and consistent interface. With the emphasis on speed, the Stellar architecture places the workload of the trading system onto the servers, enabling the front-end to focus solely on trader interaction. Stellar Trader responds instantly, even in the busiest market conditions. 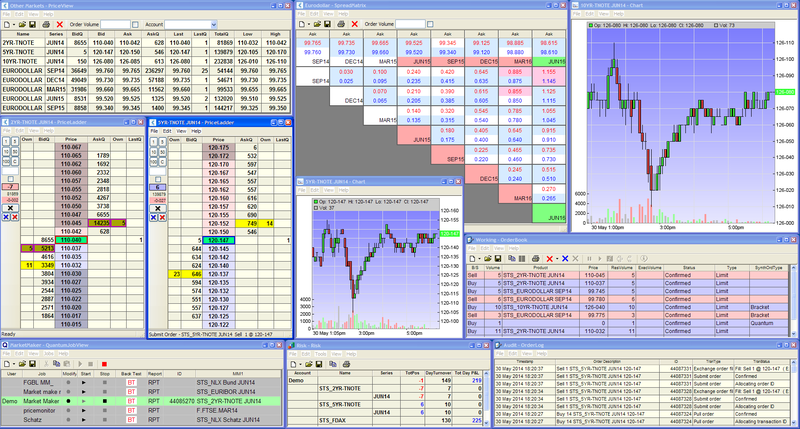 All standard trading screens, including grid view, price ladder, spread matrix, and time and sales. Powerful synthetic order types, including stops, icebergs, brackets, OCOs, and conditional orders. All synthetic order functionality is server-based for maximum performance. Stellar Charts is a fully integrated charting package. Powerful and simple to use, charting both exchange-listed contracts and user-defined synthetic spreads. Multiple workspaces per trader for quick switching to alternate screen layouts. Full account based pre- and post-trade limit checking. Fast Excel integration using the Stellar RTD server. Fully customisable front end reduces initial learning curve, minimising migration disruption. Dynamic vertical depth display assists ultrafast order entry and intuitive visualisation of the market. Extensive range of keyboard shortcuts for fast trade entry and different trading functions can be assigned to each mouse button. The Stellar spreadMachine trading platform from Stellar Trading Systems is the ultimate cross-market cross-product spreading tool. It operates as a server-based system designed for deployment within exchange colocation facilities. This allows it to build upon the high-performance order-routing engine within the Stellar architecture and respond to market movement as swiftly as possible. The spreadMachine harnesses the power of its server hardware whilst leaving the trader’s workstation free to focus on order entry and price display. Automatically works inter-market spreads, managing leg orders and balancing the spread as required. Real-time overview of order activity showing current working orders, executions, and spread completion status. Fully integrated into the Stellar front end; simple to use and configure. Spreads are viewed in an identical manner to exchange listed products – in PriceView or dynamic ladder. User-defined multi-leg strategies traded seamlessly alongside exchange listed products. Simple and intuitive spread definition process. All of Stellar’s powerful synthetic order types are compatible with the spreadMachine. Spreads can be pulled or ‘shattered’ – cancelling the spread whilst preserving any orders currently in the market, retaining order book priority.